Delectable options await at Connecticut’s best taco spots. These authentic taco trucks and restaurants serve everything from Baja fish tacos, to vegetarian specials, to fusion options unlike anything you’ve ever tried! So if you’re searching for something more traditional, or you’re looking to taste test something new, go out and experience these 10 best taquerias in the state. Bartaco is an open-plan drinks and taco bar with about 15 different taco options on the menu. Dishes that take the flavors a bit outside of the typical taco fillings are shrimp banh mi, falafel, and duck with a tamarind glaze. They also serve rice bowls, tamales, fried plantains, and more. Bartaco is a popular option for a delicious meal of tacos and more at an affordable price. Perfect for a lunchtime snack or a heavier meal, El Charrito Taco Truck serves up mouthwatering Mexican food to the hungry masses. Diners will find a selection of over 20 different tacos including chorizo, al pastor, and beef brisket. If you’d prefer not to eat on the go, El Charrito also has permanent locations in Riverside and Stamford. In addition to numerous Mexican specialties, including breakfast, Los Molcajetes is well known for their authentic tacos. Tacos on the menu are filled with chicken, beef, pork, liver, and more, but with meat featuring heavily in most dishes, the menu might be a bit limiting for vegetarians. Nonetheless, if you are looking for authentic Mexican dishes, stop by Los Molcajetes. This tiny but wonderful Mexican restaurant located in the heart of Stonington Borough is a delicious local option for tacos and other favorite Mexican dishes. Lunch and dinner menus differ, each serving three taco options. Tasty favorites include the carne asada tacos, chipotle chicken tacos, and Baja fish tacos. Dishes also come with sides, making these a filling option. Perfect for small bites, Taqueria Mexicana serves about 20 different taco options, and with their smallish size, you can certainly enjoy a couple of different flavors. Favorite menu items include tacos with pork, pineapple, and onions; tacos with beef and cactus; and tacos with steamed pork. Taqueria Mexicana also has an impressive drinks menu— perfect to accompany your taco selection. Vegetarians and meat-lovers both can indulge in delectable tacos at Lucky Taco. 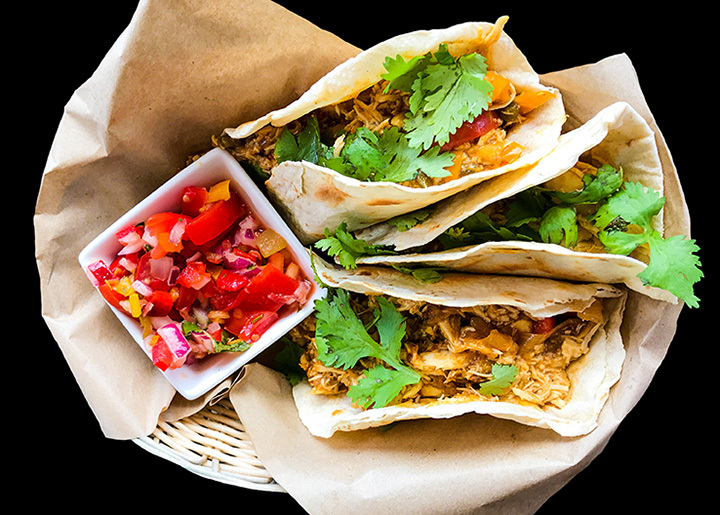 Serving Tex-Mex, vegetarian, and fusion tacos, the flavor combinations at Lucky Taco are sure to delight. Some of the more interesting options on the menu are kung pao chicken, portabella, and buffalo chicken. Hapa Food Truck—a Connecticut favorite for creative fusion—features three high quality tacos on their selective menu. Taco options include Korean short rib, Philippine chicken adobo, and crispy cauliflower, which is suitable for vegans. Track them down by checking out their calendar to try their flavorful options. The owners of Taqueria Cinco recently settled in Connecticut from Mexico and aim to serve authentic, traditional Mexican cuisine. They serve quesadillas, tortas, burritos, and of course, tacos. Everyone’s favorite traditional tacos are included on their menu, including chicken, steak, and queso, and they also serve tacos al pastor (pork with grilled pineapples) and nopales (prickly pear cactus). This unpretentious taco shop has a very affordable menu, but the dishes certainly don’t skimp on flavor or quality. Taco options include fresh chorizo, marinated chicken, and guacamole with roasted corn salsa. All taco meals come with five tacos. The menu isn’t limited to just tacos. They also serve tostadas, quesadillas, salads, and sides. Accommodating spicy lovers and those who need things a bit more mild, Rio Bravo Tacos and Tequila offers flavorful food whether picante or not. Enjoy guacamole being prepared fresh at your table, and dive right into their numerous taco options. Test out the tempura fish tacos, French tacos, or tacos al pastor—if you happen to be craving something a bit more traditional.